Winner Whistlin' Willy's (previously Crust E. Krotch's) is a popular pizzeria/arcade in South Park. It first appeared in the Season Six episode, "Child Abduction is Not Funny" as Crust E. Krotch's, seemingly a parody of Chuck E. Cheese's. The building was destroyed and burned by Yelpers in "You're Not Yelping", but it was rebuilt sometime afterwards, as seen in the song "The Yelper Special". The restaurant resembles an old-fashioned train with smoke stacks and wheels. Old wooden barrels and a wooden porch decorate the outside, similar to a general store in the 1800's. Inside, there are tables, arcade machines and monitors on the walls. 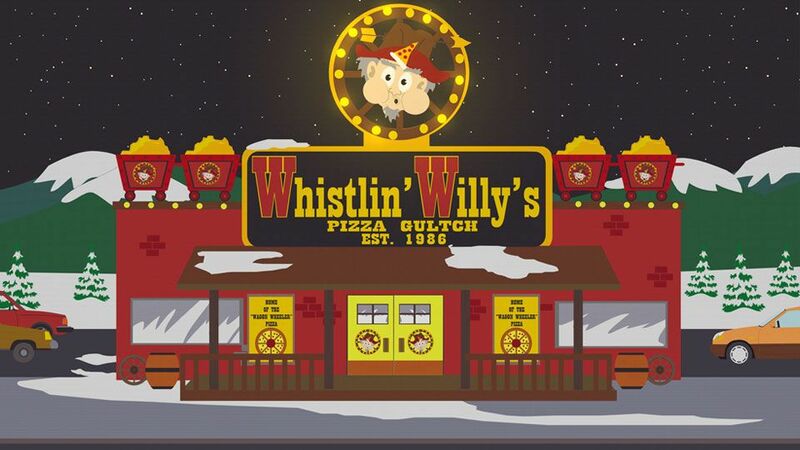 The titular mascot, "Willy", dons a costume and entertains the patrons through whistling and dancing; often he refuses to serve pizza until you whistle. The building briefly appears in the most recent intro.